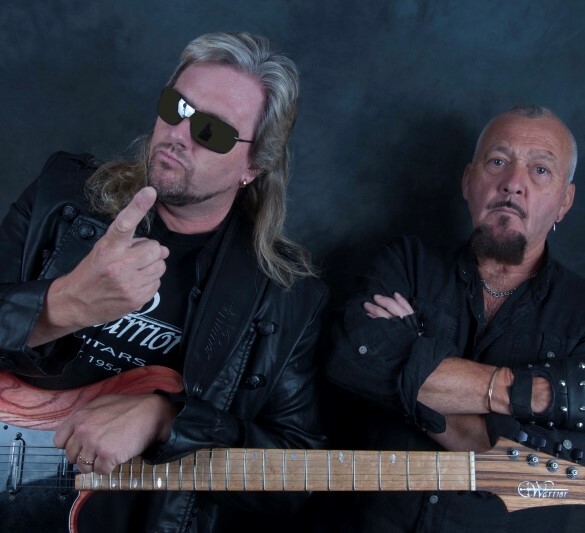 London, UK – The Atkins May Project, featuring original Judas Priest vocalist Al Atkins and guitar virtuoso Paul May return with this superb compilation. For the last four years the rock world has been buzzing about former Judas Priest vocal legend and Holy Rage heavy metal frontman Al Atkins and Christian guitarist and music artist Paul May’s new music. Together they have created three excellent records available on Gonzo Multimedia. There are enough doses of melody and metal madness to entice all fans of the genre, and while it is solid, honest, working-class heavy metal, it also has its roots in contemporary metal with some fine axe-work and killer choruses. This marriage of Metal Mayhem has earned them stunning reviews from the worlds’ press and has seen them gain a steady momentum of fans globally since their initial release back in 2011. After the worldwide success of “Serpents Kiss”, “Valley Of Shadows” and “Empire Of Destruction” once again coming straight from the “Home of Metal,” out of the heart of the UK’s “Black Country”, Atkins May Project return with “Anthology” (volume 1). This collection of Classic Rock and British Metal is an essential addition to all who love this genre that’s no afraid to merge metal moments with progressive thought. Al Atkins is known for being founder member and original vocalist with Judas Priest, notably writing such classics as “Victim Of Changes” & “Never Satisfied”, which the band still perform to this day. This laid the foundations for Priest to go on to sell over 40 millions albums! In 2010, Al teamed up once again with longtime friend, guitar virtuoso and producer Paul May to form AMP and record their critically acclaimed debut album “Serpents Kiss”. Paul May was born to play guitar! Respected for his passionate, soulful guitar work and his explosive, exciting solos, Paul is a world class professional guitarist and songwriter playing and recording sessions across the globe, appearing on over 50 albums and featured in both the secular and Christian arenas. “Anthology” marks their own territory in rock with this selection of excellent songs! This exciting compilation also features an unreleased bonus track – a cover of Phil Collin’s “In The Air Tonight”!